A famous cat in Glasgow’s West end has been abducted and its owner and friends are desperate to trace him. 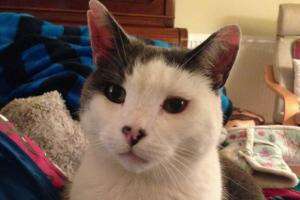 Monty the Hyndland Cat, who is a favourite of Kevin Bridges and other well known westenders including Greg Hemphill, was catnapped by a woman with a box on Saturday at 10:30pm outside his home in Hyndland Road. The mystery woman claimed he had been vomiting and was taking him to the vet – but the 24 hour veterinary practise hasn’t seen him yet. Concerned owner Abi has now asked people to look out for the thirteen year old cat which her daughter dotes on. Abi, said: “Monty is thirteen years old and we got him three years ago from a lady who had rescued him. “He is so well loved and has become a real regular at West end haunts like Nicks, Epicures and hairdressers Sonia de Rosa. Abi recently moved temporarily across the road and Monty was taken outside his old home after one of his old neighbours fed him. Occupational therapist Abi, said: “Monty visits all the local businesses and was fed by a neighbour just thirty minutes before he was abducted. The lady who took him is described as portly. “She told my neighbour that he was vomiting and she was taking him to the vet. My neighbour tried to stop her but she was insistent.